The Proposal |	The World March: A Humanist Proposal ! * Add new initiative ? 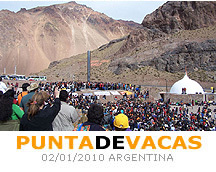 PUNTA DE VACAS 2010 - Useful Information | Requirements for transit, visas, accommodation. View streaming video | * Add new video ? * Add new link ?